Just because a film has a handful of Oscar nominees and winners in it, doesn’t necessarily mean you’re in for some Oscar-caliber viewing. 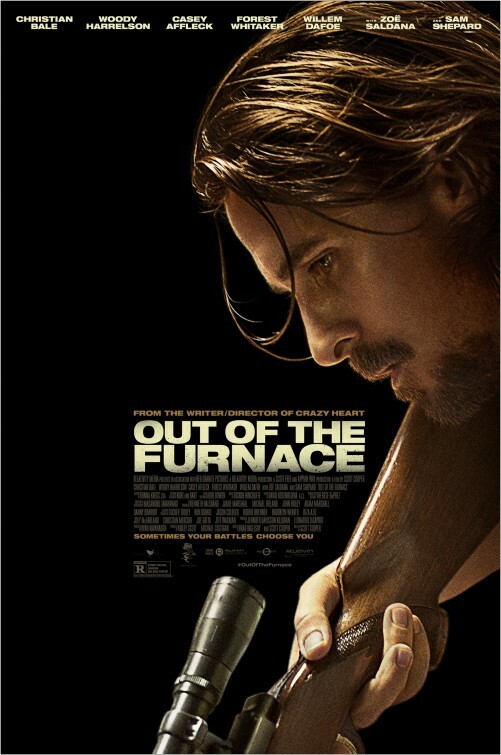 Such is the case with “Out of the Furnace”, director Scott Cooper’s follow-up to his Oscar-winning film, “Crazy Heart” from 2009. You know how it is – you see a TV spot for a film that lists off all its actors with “Oscar Winner” or “Oscar Nominee” above their name and you think “Hey, this has gotta be good.” In this case, the TV spot makes this film look like an edgy revenge thriller. Well, it’s not. In fact, I’m not sure what it is or wants to be, but the first word that comes to mind is predictable. 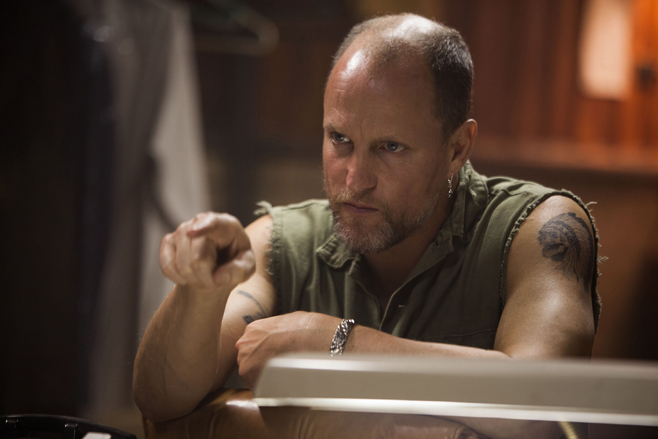 Cooper opens his film with a fierce introduction to the film’s antagonist, Harlan DeGroat (Woody Harrelson), a degenerate redneck druggie, with absolutely no redeeming qualities. Let’s just say he’s anything but charming at a drive-in date (the randomly odd choice of “Midnight Meat Train” starring Vinnie Jones plays on as the evening turns brutal) and leave it at that. And then, for some reason, Cooper fades in Pearl Jam’s melancholic hymn “Release” as the film’s title appears across the screen. I like that song. I like the band. That was a successful intro that grabbed my attention. But, it just doesn’t seem right. Something feels off and that’s exactly the predominant feeling throughout the entire film. We then meet Russell Baze (Christian Bale), a hard-working local boy pulling double shifts at a steel mill in North Braddock. We also meet his girlfriend, Lena (Zoe Saldana), who lays in bed with Russell and complains about him working so many hours. It appears she would like to have a kid, but he kind of laughs it off and changes the subject. During this time, I found the actors reciting the dialogue (co-written by Cooper and Brad Ingelsby) that I was reciting in my head. Not a good sign. It’s obvious these two are friends and l can even tell they’re in love, but something doesn’t seem right. Russell and his Uncle Red (Sam Shepard) trade-off watching over his sickly father (Bing O’Malley), who lies on his death-bed in the house he’s lived in forever. During this time, an unfortunate DUI lands Russell in jail for a while after being charged with manslaughter. His little brother, Rodney Baze, Jr. (Casey Affleck) is the only one who visits him. We get the idea that it’s too difficult for Lena to visit, but apparently not that hard for her to hook up with Chief Barnes (Forest Whitaker), which Russell learns of upon his release. Usually, Russell is bailing Rodney out of trouble, due to his gambling debts and natural nose for trouble. But, with the roles reversed, we see the brotherly bond the two of them have. But Rodney, a damaged restless war veteran, prefers to make whatever cash he can by participating in underground fights. Clearly scarred by having served four tours overseas, these fights are catharsis. It’s unfortunate the screenplay barely grazes over this, it’s an obvious trauma affecting the character, but it’s not for this film. There’s one blow-up scene that Rodney has with Russell where he goes into graphic detail regarding what he witnessed and endured, but that’s about it. We’re just left with a volatile and aimless Rodney, who can’t see himself working in a mill like his brother and pressures a reluctant John Petty (Willem Dafoe), the skeezy family friend with questionable connections, to hook him up with one last fight up in eastern Appalachia. John caves and that’s the last we see of both of them as they inevitably confront Harlan. What happens to John and Rodney occurs a good 90 minutes into this 2-hour feature and only viewers are privy to what takes place, which kind of takes the tension out of watching Russell track down his brother’s whereabouts. Once Russell sets out to find Harlan – and even once he learns what became of his brother – it’s really kind of underwhelming. So goes the entire film. It says a lot that out of the entire cast the standout performance is the richness and authenticity provided by the locations used in both Pennsylvania and West Virginia. The steel mills, dense/quiet forests, dilapidated houses and old iron bridges manage to upstage all these talented actors. There are good performances here, but considering we’ve seen these actors deliver great performances and considering the potential for this script to be a taut thriller while also providing a compelling character study about brothers (and maybe even emphasizing the whole combat PTSD angle) – well, this might have been a contender for end-of-year consideration. Bale and Affleck are good together and both of them have at least one emotional high note. Affleck’s in the previously mentioned confrontation with his brother and Bale’s is a revealing conversation he has with Saldana. But, alone, these actors just come across kind of bland and flat. Part of it is the material. but it could also be the actor’s themselves. To say that I found myself recasting these two (with Sam Rockwell and Emile Hirsch, maybe) says a lot about how absorbing they were in these roles. As you can see, I’ve thought through how this story could’ve been better. The bad part is, I was thinking about these things while sitting in the theater. As the movie was still rolling. To reiterate, just about every beat here is both predicted and projected. 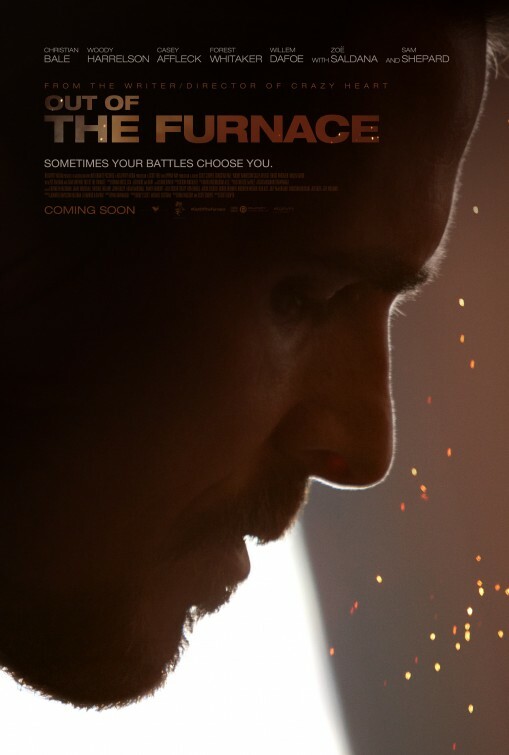 “Out of the Furnace” offers zero twists and leaves little to the imagination and therefore, it’s title is never very convincing. One usually associates a furnace with something hot and not a spark or a simmer to be found.